Lasse! comment oublieray / Se j'aim mon loial amy / Pour quoy me bat mes maris? Western music as we know it today - many individual lines of whatever nature combining in whatever manner into a single whole - has its roots in the fourteenth century, and most famously in the pioneering works of Guillaume de Machaut. Why he chose to set his remarkable poetry to music in this way we may never know, but the results continue to hold those who hear it enraptured. 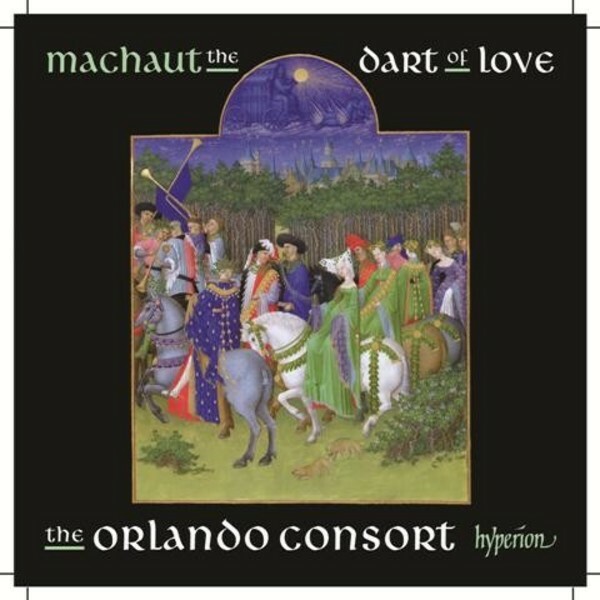 Few groups have matched the Orlando Consort - formed in 1988 specifically to explore this repertoire - in capturing and recording the essence of Machaut. This is the second volume in their Machaut Edition for Hyperion. This is the second disc in the Orlando Consort's ongoing survey of Machaut's music for the Hyperion label. The first (CDA67727) was themed around pieces associated with Machaut's poetic masterpiece, the Livre dou Voir Dit , which impressed with both the quality of the music itself and the sheer beauty of the performances. If anything, this new recording is even more impressive, for it offers a greater mix of pieces which amply demonstrate just why Machaut occupies such a crucial position in medieval music. The selection includes three of Machaut's twenty-three multi-texted motets, as well as a generous helping of his songs in the medieval formes fixes: six of his forty-odd ballades, two rondeaux, and a single solo-voice virelai. The variety is tantalising, yet all the pieces explore different facets of the ideal of courtly love, albeit with often markedly different emphases. The celebrated three-voice motet Lasse! comment oublieray is the story of a woman beaten by her husband for her blameless conversation with another man. Over the long-held notes of the tenor, the upper voices relate different aspects of her story. This performance has more bite than the celebrated but rather languorous recording by David Munrow's Early Music Consort, an approach fully justified by the text. Yet there is no shortage of sensuality when appropriate. In Helas, tant ay doleur et peinne, a melancholy two-voice ballade which reflects on the misery and pain of love (and which gives the disc its title), the upper voice weaves a sensuous line over the longer notes of the lower part. The concluding four-voice rondeau, Rose, lis, is exquisitely done, its use of mixed metric patterns (hemiolas) imparting an irresistible lilt. Alongside the two-voice ballade Pour ce que tous mes chans fais, the Orlando Consort perform the snappy hunting-style chace which serves as its basis, thought to be by Denis le Grant, which reveals that the poet's true love is� hunting with his falcon! It's a nice touch which reveals something of the hinterland to these fourteenth-century pieces. As with their other recordings of this repertoire, the Orlando Consort forego the use of instruments in favour of a purely vocal approach, something that's easy to justify when the singing is of such quality and blend. Dip into any track at random and the listener is transported into a richly rewarding and endlessly fascinating soundworld in which poetry and music are entwined as they can only be when they flow from the same pen. This project enjoys support from leading experts in the field of Machaut research, and the notes by Anne Stone are a model of how these things should be: accessible but exceptionally informative. There are full texts and translations, and the whole disc manages to be deeply satisfying while still whetting one's appetite for more.